This is my first experience of a Hyatt Place in Asia, the Hyatt does not have a lot of Hyatt Place property in this region. Lately, I’ve been hearing quite a few of them opening in Asia. We were thinking that if we liked their property we would plan to stay there more. We know that Hyatt Place Foshan is due to open, there is also a Hyatt Place Shenzhen. We had always wanted to plan a trip back to Phuket, Thailand for its amazing weather, beaches and people. After securing a cheap return Jetstar ticket, will talk about the flight and lounge later, we were in a hotel hunt. There are 2 Hyatt properties in Phuket – Hyatt Regency Phuket Resort and Hyatt Place Phuket/Patong. We like the idea that Hyatt Place offers free Hot Breakfast throughout the stay and its location at the northern part of Patong beach, so we decided to go for Hyatt Place Patong. 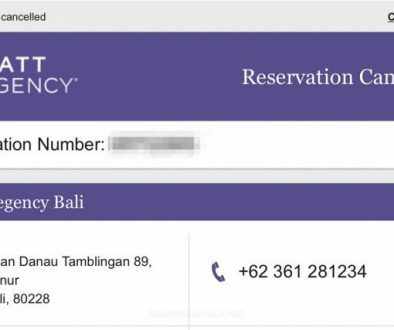 Initially we were thinking of redeeming our stay using only points however, upon looking at the offered price by Hyatt Places Patong Phuket, we decided to pay full price for it. 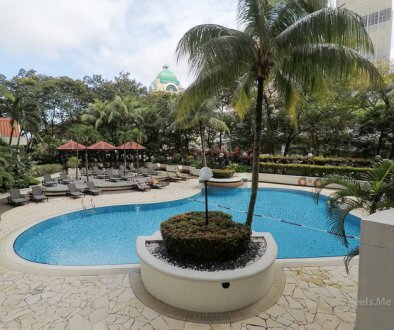 Then, we would earn some eligible nights in order to hit the Hyatt 25 nights stay and 75,000 bonus points promotion that ended on 30th November. We booked Hyatt Places Patong for six nights, arriving on a Sunday and leaving on Saturday evening. The intention was to get away from the weekend crowd but still be able to kind of experience it on the Friday before we leave. 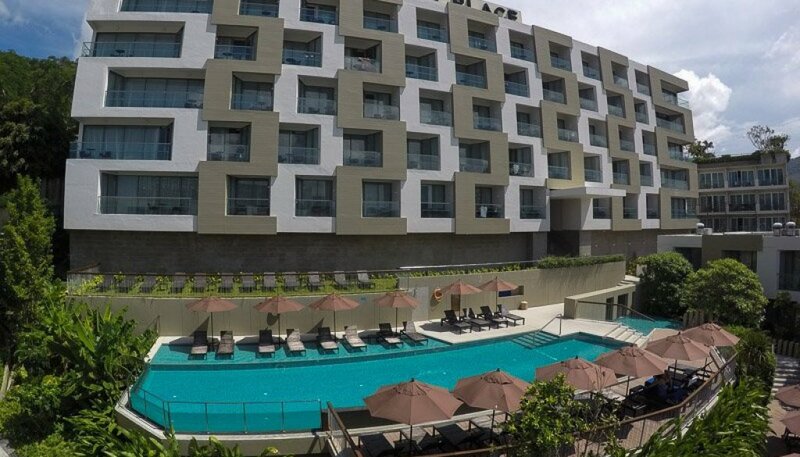 Hyatt Place Patong is located at the northern part of the famous Patong beach. To us, this translated as a quiet environment, away from the loud bars and night clubs. There is a 24 hour Family Mart convenience store within 5 minutes of easy walking and the famous Patong beach is just past the Family Mart. We walked to Bangla road and back, it took us a good 30 minutes but we were walking and stopping at shops. Bangla road is where things happen in Patong – Night clubs, bars, ping pong shows, lady boys and exotic shows. Good thing in Phuket is if you sign up for either a city tour or island hoping they will fetch you at your hotel. We arrived at Phuket International Airport around 9.20am. After sorting out immigration and transportation, we were on our way to Hyatt Place Patong arriving at 11.15am. Lin, the lady who checked us in was sweet, she greeted us and let us know that our room was ready. We knew that we were early and therefore were delighted to know that our room was already waiting for us. She also told us that our room was upgraded from the standard room to a pool view room. We’ve got 6 nights of pool view to enjoy. We thought we would have 6 nights of pool view to enjoy but, unfortunately, we needed to change to a different room during our last night because the air condition in our room stopped pumping out cool air. We are not sure if it is a standard protocol but Lin escorted us to our room and did a proper guide telling us what’s available in the room and also where the safe is. That’s a gesture which we appreciated. Upon entering our room, we thought that it was spacious with a small little couch at the corner and a nice balcony with a table and two chairs overlooking the infinity pool. We shall let the photo tell the story now. We truly love the Hyatt Grand King bed, for some reason I always get a really deep sleep whenever I am sleeping on their bed, it is a bit weird but true. We had a nice mini balcony too, a good zoning out or snack area. It seemed like all rooms came with a private balcony. The amenities provided were simple. A kettle to boil hot water for coffee and tea, ice container and two bottled water, which were replenished daily. There was also an empty minibar fridge, which allowed us to store all our loot from the store. Here’s a glimpse of the corner couch in the room, it is smaller compared to the one at Hyatt Place Seattle, but hey, we spent some time watching a couple of movies here. Did I mention that two bath robes were provided too? Note: we realized that the bath robes were not provided in the new room when we were moved on our final night. Therefore, we are not sure if the housekeeping forgot to put it in or if it is only available in selected rooms. Room service is 24 hours, a menu is provided. We liked the balcony where we enjoyed some hot tea and also used it to dry our beach and pool clothes. We thought that was really convenient, not sure how housekeeping feels about that, but it seems like a thing to do when we look at other people’s balconies. Just another view of the room. We quite like the simple design. Practical USB ports and multi countries friendly sockets were available on both sides of the bed. I am guessing that this is a feature of newer Hyatt hotels because we saw these style plugs at the Park Hyatt Guangzhou too. This is a need everyone has! While it is a good feature, it did charge a bit slower than your iPhone charger, for us it didn’t really matter that much as we normally left our phones plugged in overnight. Similar to the Hyatt Place Seattle, the room was simple, with a western toilet and a separate space with a shower head. The basin was rather awkwardly shaped though – a long rectangle, anyway it did the job. Instead of the advertised Kenet MD™ luxury skin and hair care amenities, our room had the Portico hair and skin products. This is the same ones we had at the Hyatt City of Dreams, Manila. We like them, especially the body lotion. Though, our favorite Hyatt body lotion remains the one provided by Park Hyatt Shanghai – The Aromatherapy Associates London. One last thing, about the room, slippers and a safe were provided too. The safe had directions in a multitude of languages and was big enough to house our 12″ Macbook. The gym is located in a separate building, close to the pool. While it is not the biggest gym, it certainly satisfied the need to exercise. There were two treadmill machines, a cycling machine and some free weights. There is also a mat for those who fancy some yoga and a large exercise ball to burn off all the Pad Thai. Towels were provided at the gym as well as bottled water. Our room had two bottles of water daily, from housekeeping, which was definitely not enough for our daily consumption. Since we had been using the gym almost everyday, we normally grabbed an extra bottle of water after our workout so that we could have some water for our walk into town. While the gym did provide some sort of Andaman Ocean view, it can be rather hot too. We were there around 2pm and had direct sunlight shinning at the treadmill and also some of the other machines. You sure do get some sun in this indoor gym too. I would imagine it will be a nice view during sunset. We spent quite a bit of time dipping in this pool. I think it is around 20 meters from end to end. We did a few laps in the pool, which is do able with its size. The depth of the pool is between 0.9m to 1.1m. There are plenty of reclining chairs provided to anyone who would like to relax, to swim a lap or two or to finish a book. We saw quite a few people who enjoyed taking selfies in the pool too. One thing that we noticed is the pool water tasted really bad, I am not sure if it is the due to the pool being new or the water quality in Phuket. I remember reading someone commenting about this too during their stay. I wonder if Hyatt will be doing something about this. There was a small bathroom that was shared by the gym and pool users. There was only 1 shower room and 1 toilet, multiple lockers with keys were available. Pork bacon is available together with a variety of eggs served to your preference. If you fancy a scramble egg or an omelette the chef was happy to make you one. A nice gesture from the chef – sometimes when you walk pass the egg corner as the chef would offer to cook you an omelette, proactively. Usually the chef would even serve it right to your table, a service that didn’t go unnoticed by us. Here’s practically a display of what was available for breakfast. I thought the potato with cheese was quite nice. Add some Thai chili to the fried rice, it will be tasty too! The cheese selection was limited however one should be glad that Hyatt Place even served cheese. We only tried it once during our stay, it felt “too melted” probably due to Phuket’s weather as the restaurant was an open air restaurant. I made myself a little pancake with honey and a local banana. These small bananas are so sweet! Remember to try them when you are in Phuket, or, I believe, they are available throughout South East Asia and do have a unique flavor. The lobby is quite inviting, we walked pass this place everyday to go to the restaurant for our breakfast. Our favorite was sitting on the “Hanging Basket Chair” and spinning around. Part of this article was composed here. This area is very spacious and could be a really nice protected space when it is windy and/or rainy. As most people were out for sight seeing in the morning, it was a quiet place to hangout while enjoying some natural breeze. Our air condition decided not to pump out cool air on the 5th night of our stay, we thought it was a temporary issue and slept through the night, waking up feeling really sweaty and with a wet floor. The floor was slippery, not the best situation for a sleepy person to walk on. We are not sure what happened but we couldn’t do another night without air conditioning, we informed the Gallery Host the next morning before we left the hotel. 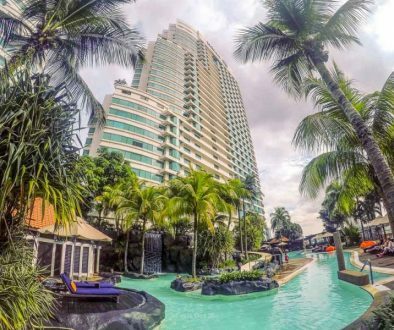 How did the Hyatt Place Patong handle our air conditioner malfunction issue? The Gallery host acknowledged the issue, apologized, showed empathy and mentioned that they will get an engineer to have a look at the air condition. From the conversation, it seems like the wet floor happened due to the difference of temperature between the room and outdoors. Air condition was still not pumping out cool air. House keeping was not done properly – A drinking glass was missing while the other one was not washed. Bed was made but the side table were not wiped. We were confused. We were wondering what happened. We rested for a while before heading to dinner. Upon speaking to the Gallery host, he told us that they had arranged another room for us, on the same floor which should be convenient for us. He then made us the room key for the new room and let us know that we could move in on our own time. We thanked him and went out for dinner. He did offered to help us with the move, we thanked him and told him that we could manage it. While Hyatt Place Patong did provide us with a resolution – changing us to another room with a working air conditioner, it would have been nice if they could have either have left us a note in the room and/or leave us a voicemail or even send us an email to inform us their resolution on how they would like to handle the situation instead of waiting for us to ask the Gallery host. Was there any effort of service recovery by Hyatt Place Patong? Not during that time. One of the Gallery Host, Ausy, did allow us to check-out at 3pm the next day when we requested for a late checkout. While she did not mention the reason, we choose to believe that it was an effort of service recovery. There was a third party travel agent right at the main entrance of the hotel. One can book tours through the agent from island hoping to sight seeing around the island here. We asked around Patong beach area for tours but decided to ask him too since he is right at the hotel and it could be convenient. We were willing to pay a bit more knowing it was located at the hotel. We were quoted 2,000 Baht for an island hoping tour per person, after asking if this was the final price, he asked us back saying how much do we want to pay? (Just like any bargaining for Tuk Tuk and tour is in Phuket) For the same package, we were offered 2100 baht for two at one of the tour booths. We left and could not be bothered to ask for other tours. Our expectation was lower than the Grand Hyatt, Park Hyatt or Hyatt Regency. We paid a much lower price for Hyatt Place Patong and for this, we were quite happy with the room and free hot breakfast. A USB port at each side of the bed (Total of 2) together with a plug too. Multiple plugs are available. This is important for us to charge our batteries, Macbook and phones. Our malfunctioning air conditioner situation could have been handled better, much better with more communication from the Hyatt Place Patong. We will return to this hotel, if we are able to get similar good rate, or else we will consider another beach in Phuket. If you need a few nights to qualify or re-qualify your Gold Passport Status this would definitely be a “Hyatt mattress run” hotel to consider.